At what point does the fourth wall stop? I only ask this because there’s a point where an audience member will have to know not only the plot of the film that started the franchise, but the subsequent reactions to the film, the complete history of comic books, and the entirety of the lyrics to Gilbert and Sullivan’s “The Major-General’s Song” to understand the references. While Deadpool (2016) maintained that sly balance between knowing winks to the superhero genre as a whole and being an actual superhero film, Deadpool 2 (2018) almost went toward both extreme ends in order to maintain its balance. There were plenty of references and little sight gags that will leave true fans of the franchise pausing their Blu-rays for years to come, and I certainly did appreciate some of the meta-humor, but only to a point. Strangely enough, Deadpool 2 felt more like a superhero film than its predecessor, which seems odd as it seemed to be mainly poking fun at the genre as a whole. Sure, plenty of movies can be “self-aware,” but when you start to realize “oh, they’re serious here,” then the meta gags don’t work as well. While often crude and gory, I do have to admit that many of the jokes really work in Deadpool 2, much like they did in its predecessor. I was still laughing at the ridiculous situations the X-Force found themselves in, which I felt was the best surprise gag of the movie. Much like Ant-Man (2015), Deadpool 2 works as both a comedy and a superhero film, especially once you realize that its primary purpose is to be a comedy. While the superhero bits distract a little from the comedy in this movie, the action sequences, especially the ones featuring Domino (Zazie Beetz), are top-notch and somewhat make up for it. 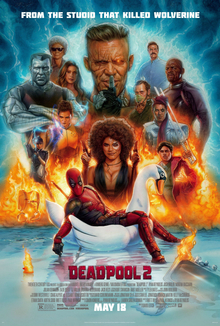 A hilarious meta-comedy that’s almost too serious and meta for its own good, I give Deadpool 2 4.0 stars out of 5.